Born: 6 December 1933, at Goshen, Indiana. Family: m. Sara Ann Kauffman, 8 Jan. 1955; four children, b. 1955-1971 (Gerald W., J. Carlyle, Roderic A., Kristina J. ); 8 grandchildren; 2 great-grandchildren; widowed Sept. 2009. Public schools of Elkhart County, Ind. : grades 1-11. Eastern Mennonite High School, Harrisonburg, Va.: grade 12; graduated 1951. Goshen College: attendance 1956-1960; B.A., 1960. University of Wisconsin: graduate study, 1960-1965; M.S. in History, 1961; Ph.D. (in U.S. Social History), 1966. Goshen College Assistant or Associate Professor of History, 1965-1976; Professor of History, 1976-2004; gradually retired, 1998-; Emeritus, 2004-. Project Director under a research grant from the Welfare Administration, Department of Health, Education, and Welfare, 1967-1969. Director, Goshen College Study-Service Unit in Costa Rica (on location), April 1970 to July 1971 and August 1986 to July 1987. National Endowment for the Humanities Research Fellow, Princeton Univ., 1976-1977. Visiting Fellow, Notre Dame University, July to December 1989. “Pacifism and American Civil Religion” (February 1990). “Pacifism in American Religious Traditions (Other than Historic Peace Churches)” (sponsored by Goshen College and Pepperdine University, September 1992). “Anabaptist Vision(s) in the 20th Century” (October 1994). “Models for Christian Higher Education” (1998, as part of the study listed immediately below). Goshen College’s participant, 1994-1998, in a Lilly Endowment-sponsored study of selected colleges which have succeeded in maintaining strong ties to their churches; author of chapter on Goshen College in the resulting book–Richard T. Hughes and William B. Adrian, eds., Models for Christian Higher Education: Strategies for Success in the Twenty-First Century (Grand Rapids: Wm. B. Eerdmans Publishing Company, 1997). Senior Fellow in residence, The Young Center for the Study of Anabaptist and Pietist Groups, Elizabethtown College, 1995-1996 and 1996-1997; also Interim Director of the Center in 1996-1997. Mennonite Historical Society: Secretary, 1974-1984; President, 1984-1992; member of its Board of Directors, 1974-1999. Member of The Mennonite Quarterly Review Board of Editors, 1974-1992. Interim Editor and Managing Editor, The Mennonite Quarterly Review, 1992-1994. Co-Editor-in-Chief, Studies in Anabaptist and Mennonite History (book series), 1977-1987; Editor-in-Chief, 1987-2000. Editor, Mennonite Experience in America (history writing project producing a 4-vol. series), 1977-1996 (writer of Vol. II, editor of Vols. I, III, & IV). Pensions for Professors (Madison, Wis.: The State Historical Society of Wisconsin, 1963). Edwin E. Witte: Cautious Reformer (Madison, Wis.: The State Historical Society of Wisconsin, 1969). “Rationality and Welfare: Public Discussion of Poverty and Social Insurance in the United States, 1875-1935” (report to the Welfare Administration, 1969; published on-line by the Social Security Administration, 2001; http://www.ssa.gov/history/reports/schlabach.html). “Reveille for Die Stillen im Lande: A Stir Among Mennonites in the Late Nineteenth Century,” The Mennonite Quarterly Review, 51 (Jul 1977). “The Humble Become ‘Aggressive Workers’: Mennonites Organize for Mission, 1880-1910,” The Mennonite Quarterly Review, 52 (Apr 1978). “Mennonites, Revivalism, Modernity–1683-1850,” Church History (Dec 1979). Gospel Versus Gospel: Mission and the Mennonite Church, 1863-1944 (Scottdale, Pa.: Herald Press, 1980). Peace, Faith, Nation: Mennonites and Amish in Nineteenth-Century America (Mennonite Experience in America Vol. II; Scottdale, Pa.: Herald Press, 1988). Co-Editor of Theron F. Schlabach and Richard Hughes, eds., Proclaim Peace: Christian Pacifism from Unexpected Quarters (Urbana and Chicago, 1996), essays originating in the 1992 conference at Goshen College, mentioned above. Extended chapter, “History,” pp. 17-130 in Ervin Beck, ed., College Mennonite Church: 1903-2003 (Goshen, Ind. : College Mennonite Church, 2003). 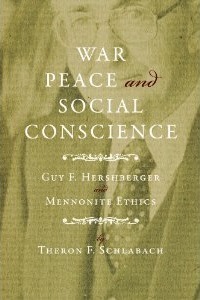 War, Peace, and Social Conscience: Guy F. Hershberger and Mennonite Ethics (Scottdale, Pa.: Herald Press, 2009). Various lesser articles, and book reviews. Member of College Mennonite Church, Goshen, Ind.